Welcome to Before & After Kindergarten! 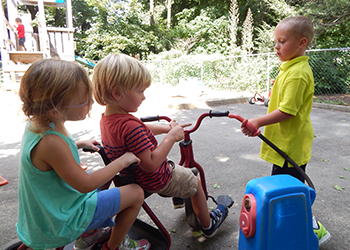 We offer both before and after kindergarten care with busing for children attending Darcey School. The program provides children with a balance of freedom and activities and a place to unwind before or after the work of Kindergarten. It offers an environment that is interesting and engaging while providing opportunities for social interaction and daily outdoor play. Our Before & After Kindergarten program requires a minimum enrollment of two days with availability up to 5 days. Early morning drop-off begins at 7:30 a.m. to bus arrival. An afternoon program is available from bus drop-off to 5:30 p.m. Although our program is closed on major holidays and during the December break, we are able to provide care for kindergarten children on days when Cheshire Public Schools are closed such as Rosh Hashanah, Yom Kippur, Election Day, professional development days, and school vacation weeks (with the exception of December break). We can also accommodate kindergarten children for delayed openings beginning at 8:30 a.m. and early dismissals due to severe weather conditions. We do close when Cheshire Public Schools close due to unsafe weather conditions. Parents of kindergartners must request bus transportation between 1st Church Preschool and Darcey School by submitting a “Seat Petition Form” to the Cheshire Public School Transportation Department at least two weeks prior to the start of school. 7:30a.m. to Bus pick up to Darcey School. Bus drop off from Darcey School to 5:30p.m.